Welcome and thank you for visiting our site, your site. 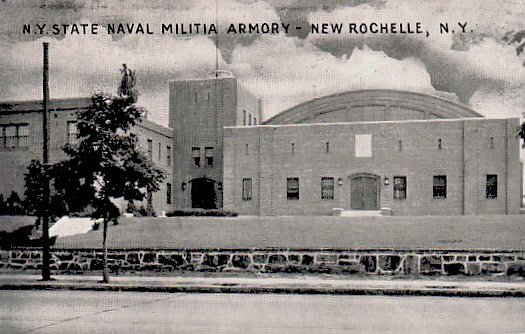 Without doubt, the Armory belongs to all of New Rochelle and its many fine citizens. The Save Our Armory Committee is currently putting together a business plan as a response to the recent City- issued Request for Proposals (RFP). It is our hope that our plan will persuade the Council that we have the best interest if the City in mind. We will show how a properly planned, revitalized Armory will be the stimulus for a new chapter of economic growth, community enrichment and showcase highlighting the best of what New Rochelle has to offer. We have a lot to be proud of right here in this fine city. As the signpost at Eastchester Road proclaims, “Rich in History”. Let’s capitalize on this, celebrate this, as we move forward with a vision of New Rochelle that exceeds its expectations. So join us here at the Save Our Armory Committee in bringing that vision into a reality. Come to our meetings (NEXT ONE IS THURSDAY, MAY 31ST AT 7:30PM IN THE POST LEGION HALL 112 NORTH AVE, NEW ROCHELLE) and see the plan unfold. Contact your elected officials and tell them this is the way to go. Most of all, get involved with us and spread the word about the benefits to the city this plan will bring. So welcome again, read up, get involved, but most of all Thank You. In this series, we will begin to look at various armories around the country in an effort to represent how their intrinsic value served as a foundation to link the past with the future. While the actual applications may vary, you’ll start to see a theme of community enrichment on so many levels. 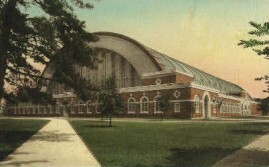 A marvelous structure from both design and engineering standpoints, the Armory now houses the University of Illinois Men’s and Women’s Track and Field events. 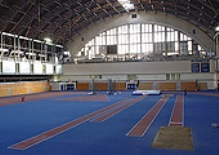 From the UI Fighting Illini Facilities website : ” When completed the Armory was the largest free-span, no center support system, structure in the world. The “drill hall” now referred to as the main floor, measures 200 feet by 400 feet with a ceiling height of 98 feet.” * Impressive in its own right. Intercollegiate athletics, local sports at a national level, just one of the many ways these grand structures continue to weave the fabric of a local society as they unlock the potential of future generations. 97 years of service, generations of students moving on to change the world, setting the example for those who follow. Go ILLINI ! A cluster of mediocre co-ops or a community enrichment facility in a historical setting, what would serve the interest of New Rochelle best? The answer is clear. IT’S YOUR ARMORY – USE IT ! Historical postcard courtesy of US Town Views “The largest town postcard website”. Visit their site, there’s something for everyone.